Christmas is a wonderful time of year, isn't it. People are giving - the climate is happy - and the air is festive as well. However, their are some folk who use this time of year for their own sordid pleasures. Like Director: Richard Boden; and Actors: Rowan Atkinson, Robbie Coltrane, and Tony Robinson. But only for 42 minutes in 1988. It’s Victorian era England, and Queen Victoria with her husband, Prince Albert, are about to venture into the streets of Old London town, to bestow unto one of the nicest men in England a lofty reward. And who might that man be? Correct - Ebenezer Blackadder (Rowan Atkinson) - that's who. Today in particular - Christmas eve - Ebenezer spends most of his time in his ‘mustache shop’, giving away his possessions to whomever he meets. To Mrs. Scratchit, he gives his money – to his goddaughter, Millicent, he gives all his presents – and to Beadle and his orphan charges, he gives his chestnuts. So when the King and the Queen eventually turn up (in disguise), to ask Ebenezer, if he can give something to charity - he has nothing to give - not even via his assistant, Baldric (Tony Robinson). OK, what can Ebenezer do next, huh? Err - nothing really - except go to bed - while the Queen promises to return the following day, for a re-cap. However, that night, whilst Ebeneezer is as snug as a bug in a rug, he is visited by the ghost of Christmas pasts (Robbie Coltrane), whom, after a quick ‘hello’, shows him two tales of his ancestors past. Please note, both of these 'visions' - though different in era - presents a similar tale in which ‘the Blackadder’s’ manage to gain the upper hand at Christmas time using their dastardly attributes. Obviously, Ebenezer is intrigued by what he has seen, and so he goads the spirit to show him two scenarios in which: (1) He was bad in the future. And (2) In which he was good in the future. Now in the ‘bad’ one, his ancestors become rulers of the universe – and in the ‘good’ one, his ancestors have to wear a jock strap. So what do you think Ebenezer does the following day, when the Christmas ghost is long gone, and he is presented with people who need him on Christmas day. Yep - that's right - what next transpires is a rather strained Yule tide tale all in all. As charity begins at home - the needy gets stripped to the bone - and royalty is abused in tone. 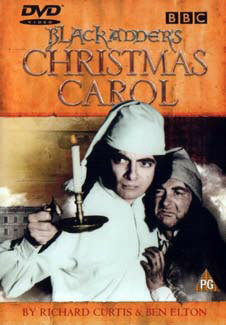 Now in my most humble opinion, 'Blackadder's Christmas Carol' is British comedy at its finest. 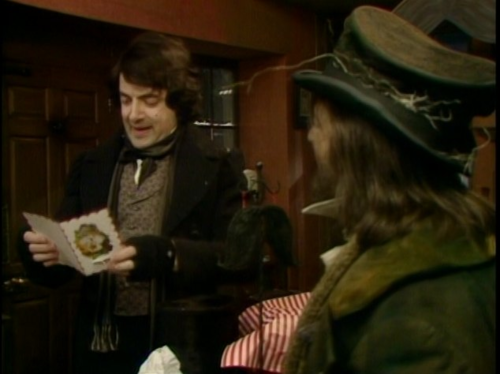 You see, scriptwriters, Richard Curtis and Ben Elton, have taken the concept of Charles Dicken’s Christmas Carol – reversed it – and then sprinkled upon it in abundance, the pathos of Blackadder lore. Listen, I’m sure that you can gather from what little I have said so far, that I am ‘slightly’ biased where all things 'Blackadder' is concerned. I've been a big fans since the eighties, literally being brought up on this style of humor since I could 'take the piss'. Granted, some people may think that this type of satirical commentary is kind of distasteful were history is concerned - and in some way I can respect there opinion. But to me, the true nature of comedy is to subvert – to satirize – to be silly – and not to be ashamed of doing so. Such is the Blackadder way, COWERBUNGER!!!!! Personally speaking, 'Blackadders Christmas Carol' does all four of these concepts in abundance, and does them in style. As ever, Rowans Atkinson is just delectable as all of the ‘Blackadders’ - bringing with him his usual sardonic stance and pitch perfect pronunciation. Also, likewise for Tony Robinson too - as the ever reliable and downtrodden Baldric, being abused, used and perused, in his own ever lovable way. Honestly, I would like to say something bad about this comedy - I really would - just to give this review a more balanced perspective. Though the only thing that I can come up with, is that the sets look a bit naff, and why didn't the Queen give Ebenezer his reward on the first day she met him. Picking at straws, I know. But then again, if the set’s where too polished, then the overall feel of the story would be too blasé – and if the Queen gave Ebenezer his reward on the first day she met him, their would be no story.